January 26, 2004 – Rajon Rondo commits to the University of Kentucky under Head Coach Tubby Smith. Rondo leaves high school ranked as the 5th best point guard in his senior class and 25th best player overall in the 2004 recruiting class. June 28, 2006 – Rondo forgoes his final two seasons at Kentucky and is drafted 21st overall in the 2006 NBA draft by the Pheonix Suns, and is immediately traded to the Boston Celtics. 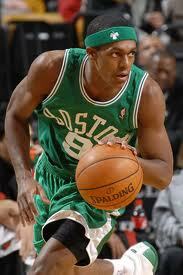 Rondo is the first point guard chosen in a deep class of forwards and centers. January 20, 2007 – Rondo records his first Double-Double, pulling in 10 boards along with 10 points against the Washington Wizards, verifying his promise as a rebounding guard. February 2, 2007 – In his first career start Rondo scores 23 points, dishes 6 assists, grabs 6 rebounds, and swipes 4 steals in 43 minutes worth of work, showing the promise of both his stamina and complete game potential. February 29, 2008 – Rajon Rondo dishes 16 assists became the first Celtic to break 15 assists in a single game since Sherman Douglas in Boston’s 1995 campaign. June 2008 – Rondo finishes the 2008 post-season recording the second highest single assist mark by a Celtic in post season history (172). December 3, 2008 – Rondo records his first career triple-double against Indiana. Follows immediately with a second Triple-Double in Dallas on February 12, 2009. December 28, 2009 – Rondo becomes the third Celtic ever to post 30 points and 15 assists in a single game, joining Boston legend Larry Bird and Bob Cousy. 2009 All-Star team, his first appearance. Posts two more Triple-Doubles in the 2009 Playoffs moving his career total to 6. May 9, 2010 – Rondo leads the Boston Celtics to a Game 4 conference semifinals victory against the LeBron James-led Cleveland Cavaliers. Rondo leads the team in points (29), rebounds (18), and assists (13). October 30, 2010 – Rajon Rondo dishes a career high 24 assists to go with 10 points and 10 boards for his 7th career triple-double and a tie for the all-time record for assists in a triple-double game. January 27, 2013 – Rajon Rondo tears his ACL in a game against the Miami Heat and is forced to sit out the rest of the season with the injury.